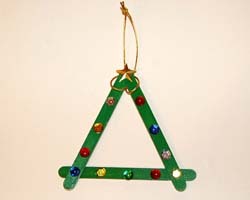 This preschool ornament craft is made using craft sticks, and any child can put together by themselves. 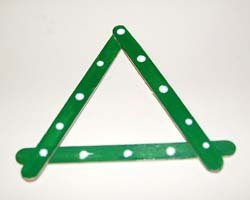 When working with preschool kids, it is best to keep the crafts really simple and quick to make. Children this young can have shorter attention spans, so this craft is perfect. You may find some children decorate their ornament really quickly, and others may take a lot more time with the decorating step. 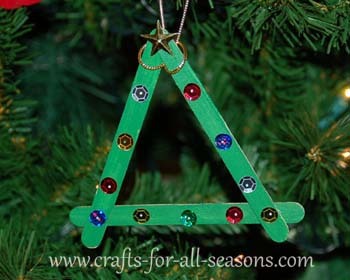 Since craft sticks, glue, and sequins can be bought in multi-packs these ornaments are very inexpensive and very simple to put together. The children will have a lot of fun decorating them! 1. 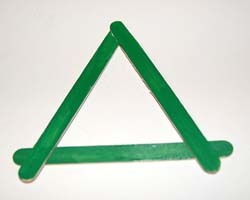 Begin this craft by having the child paint three craft sticks green. 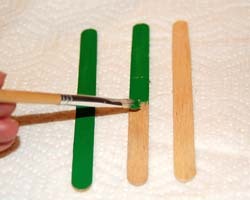 Allow them to dry well before gluing. 2. 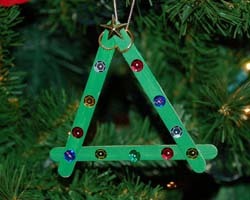 Add a drop of glue to the ends of the craft sticks as shown, then assemble the triangle Christmas tree shape. Allow to dry well. Hint: For very small children that have trouble squeezing a glue bottle, have white glue in small disposable condiment cups at the craft station, with a cotton swap for them to apply the glue. 3. 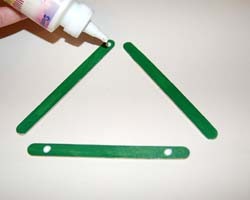 Next have the child dot glue all around the tree. Then apply sequins. Or have them apply little Christmas stickers, or decorate with glitter. Allow to dry. 4. Add a cord for hanging and the ornament is complete. Be sure to mark the child's name on the back and the year it was made.